You can use our edit functionality to make changes to your will or any other document after you’ve completed the initial setup flow. On the Estate page, click the quill icon next to the document you want to edit. On the Document Details page, click the quill icon next to the name of the document. Optionally, you can click Preview first to see what information is already included. You will be taken to an edit flow, where you can select which item you’d like to edit for that specific document. 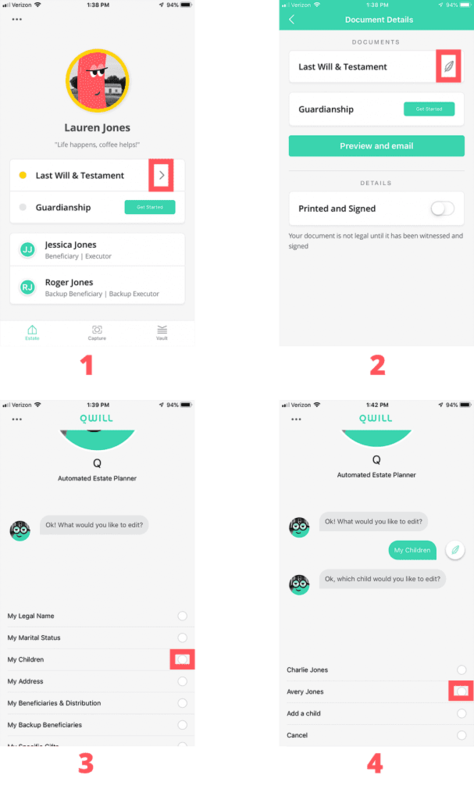 After you make a selection, Q will ask you questions to walk you through the process of making edits. After each edit you make, Q will ask you if you have anything else to edit. When you are finished with edits, you’ll be taken back to Estate page where you can click to preview your updated document. Don’t forget to download or email a copy of your new document to yourself so you can print and sign to make things official. See screenshots below for guidance on how to get to the edit flow.